A must have helmet-mounted gadget for any motorist. The SCS ETC S-9 perfect headset for safe and clean sounding riding. No sound blocking earbuds / in ears headphone. It connects motorist (up to six) via radio connection (using Bluetooth frequencies) in full duplex mode at distances of up to 1,640 ft (subject to terrain conditions) and offers simultaneous connectivity with your smartphone for receiving calls and the enjoyment of hi-fi music or podcast. 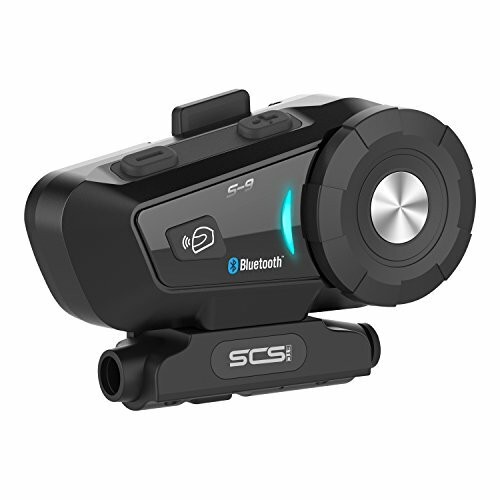 SCS ETC S-9 is the perfect gift for friends and couples who enjoy motorbike riding together! 11.Support online update (Windows XP/7/8/10). OTHER DAILY USE: Rainproof structure (IPX5), dustproof in all weather; long working time (15 hrs, 900 mAh battery); voice prompts function; can be achieved Bluetooth 4.1 and cell phones, intercom calls, stereo music, GPS and speedometer; answer or hang up calls; CVC digital noise reduction; using while charge by power bank; online update. For more detailed info, pls read product description. THE PACKAGE INCLUDED: 1 x Intercom Headset, 1 x Microphone, 1 x Microphone, 1 x Usb Charge Cable, 1 x 2.5 mm to 3.5 mm Audio Cable, 2 x Sponge Pads, 2 x Magic Sticker for Speaker, 1 x Magic Sticker for Mic, 1 x Clip, 1 x 3M Clip, 1 x User Manual. If you have any questions, pls don't hesitate to contact us, we will try our best to resolve your issue. The Design Patent was designed by California. View More In Powersports Electronics.